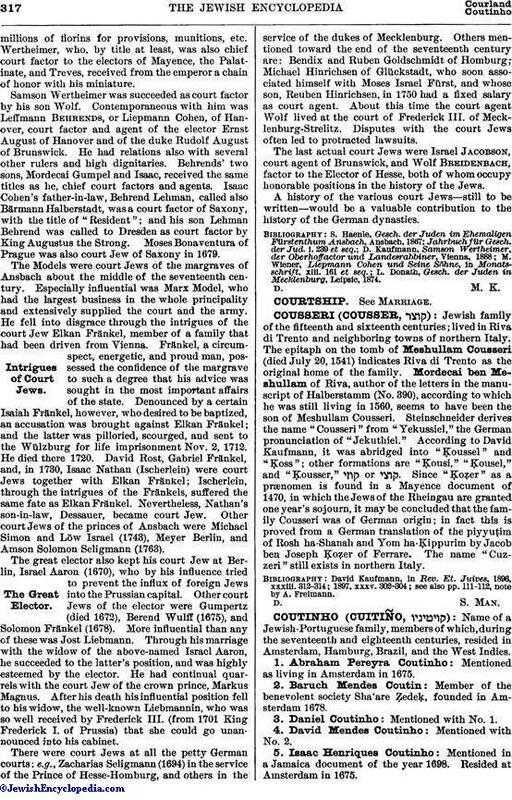 Name of a Jewish-Portuguese family, members of which, during the seventeenth and eighteenth centuries, resided in Amsterdam, Hamburg, Brazil, and the West Indies. Mentioned as living in Amsterdam in 1675. Member of the benevolent society Sha'are Ẓedeḳ, founded in Amsterdam 1678. Mentioned in a Jamaica document of the year 1698. Resided at Amsterdam in 1675. Son of Moses Henriques Coutinho (No. 11). A brother of Moses (No. 10). Mother of the dramatic poet Antonio José da Silva, and widow of João Mendes da Silva; arrested in Rio de Janeiro as a confessor of Judaism, and brought before the tribunal of the Inquisition at Lisbon, where she was imprisoned, and died in 1713 at the age of sixty-one. 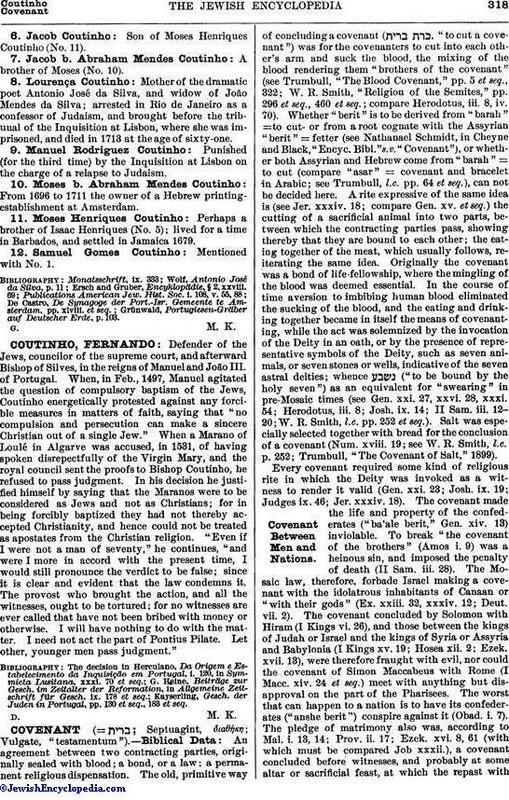 Punished (for the third time) by the Inquisition at Lisbon on the charge of a relapse to Judaism. From 1696 to 1711 the owner of a Hebrew printing-establishment at Amsterdam. Perhaps a brother of Isaac Henriques (No. 5); lived for a time in Barbados, and settled in Jamaica 1679. Grünwald, Portugiesen-Gräber auf Deutscher Erde, p. 103.